The newly protected property will help prevent new development at Esopus Meadows.Robert Rodriguez, Jr. Located within the state-designated Esopus-Lloyd Scenic Area of Statewide Significance and the Esopus Meadows Biologically Important Area, this forested land is surrounded on three sides by Scenic Hudson's 93-acre Esopus Meadows Preserve. It features 200 feet of Hudson River waterfront and is a significant contributor to scenic vistas enjoyed by visitors to Staatsburgh (Mills Mansion) and Wilderstein, popular historic sites across the river in Dutchess County. 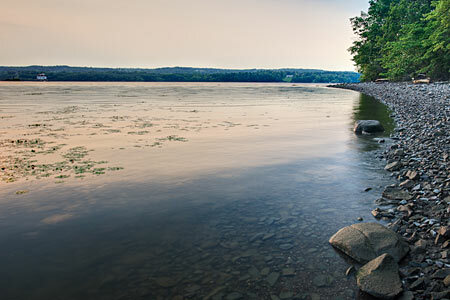 Scenic Hudson's purchase of the property, for sale at the time of the transaction, stopped potential development that would irreparably damage the ecological value of the land (which includes a large vernal pool) and degrade natural and scenic vistas enjoyed by users of Esopus Meadows Preserve. It also prevented a driveway from being carved out of an existing walking path in the preserve, while allowing for the extension of a trail along a wooded bluff offering stunning river views. The purchase is part of Scenic Hudson's collaborative campaign to Save the Land That Matters Most, protecting 65,000 acres of great scenic, ecological and agricultural significance.